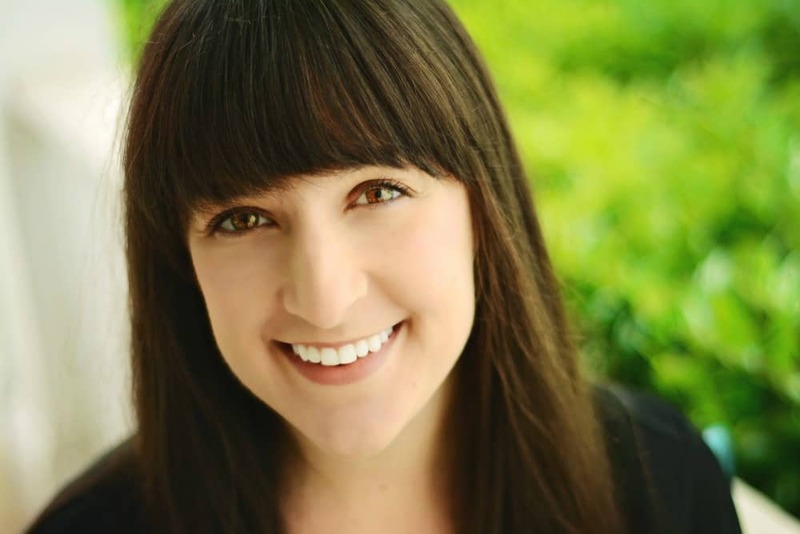 March 9, 2015 By Liz 36 Comments Note: This post may contain affiliate links. so zucchini noodles have been a regular thing. The only problem is that zucchini noodles and marinara sauce don’t have enough calories and certainly not enough protein to keep me full! So rather than making a veggie burger to eat on the side, I decided to try my hand at vegetarian meatballs made with nuts. It might sound crazy, but it’s actually a fairly popular thing in the vegetarian world! I was surprised that I liked them so much! 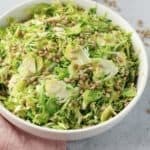 I’m not normally a big “fake meat” fan but since these are all natural and made with a few ingredients you certainly have in your pantry, it isn’t one of those franken-foods full of chemicals. Awesome, right? You could definitely serve these over regular pasta but since I was trying to keep things “Tone It Up” approved, I used zucchini noodles instead. Honestly, I love them! Now get out your food processor and let’s make some faux meatballs! This recipe makes 10 small meatballs. In a large saucepan, cook the olive oil, onion and garlic over medium heat for about 10 minutes until the onion begins to soften. 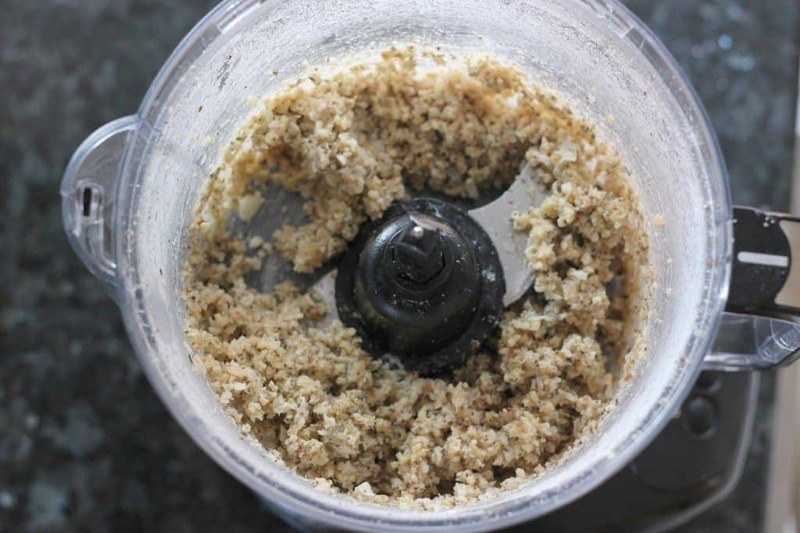 In the food processor, combine the walnuts, cooked rice, spices, and flour. Pulse until combined. (You’ll want it to look like the texture in the photo above. Add in the onion and garlic and continue to pulse until mixed. Roll the mixture into small balls and set onto the baking sheet. 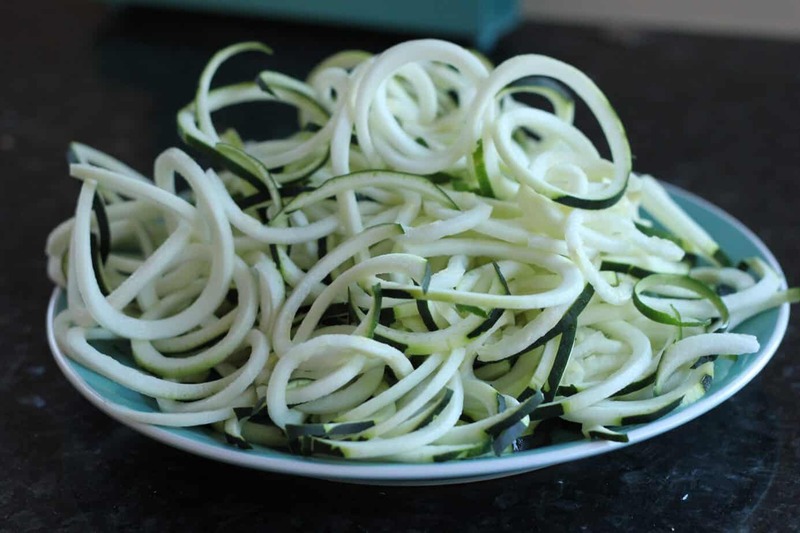 For the zucchini noodles, use a spiralizer or mandoline slicer to make thin strips of zucchini. Sautee over medium heat in a bit of olive oil for 2-3 minutes or until heated through. Drain well and serve! Top with nutmeat balls and marinara sauce. I was surprised at how full we both were after we ate this! I couldn’t even finish all of it. (If you’ve ever had zucchini noodles then you probably know that they’re delicious but not always very filling.) I actually made the nut meat mixture before church and then put it in the oven when we got home. I think these would keep in the fridge for a couple of days as well. I can’t wait to make these again! Maybe on top of some spaghetti squash next time? I should also mention how lucky I am to have a husband who willingly eats zucchini noodles and nut meatballs. Seriously, I married a good one. Have you ever tried nut “meat”? I’m very curious about those Nutballs! I’m not a vegetarian, but I do love nuts and I am very intrigued! Haha I had never had it either until we stopped at a vegan cafe in South Carolina on our honeymoon. It was so good, I can’t believe it took me this long to make a recipe with it! I want a spiralizer! 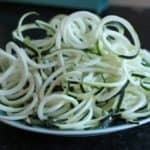 I’ve made zucchini noodles with my mandoline, but they’re not cute and swirly like a spiralizer makes them. 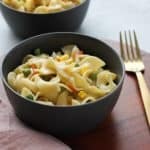 I’ve seen a lot about these zucchini and vegetable noodles and it’s something I’m really interested in trying. Your recipes always look fabulous! Yummy! I could so eat 50 plates of this! Heck yes! 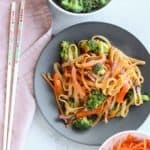 I’ve done similar things to this and I LOVE zucchini noodles! Love this! I’m doing vegan right now and I’m obsessed with two things — my spiralizer and my food processor. I’m definitely going to try these ASAP. Thanks, Liz! Awesome!!!! I hope you spiralize everything!!! 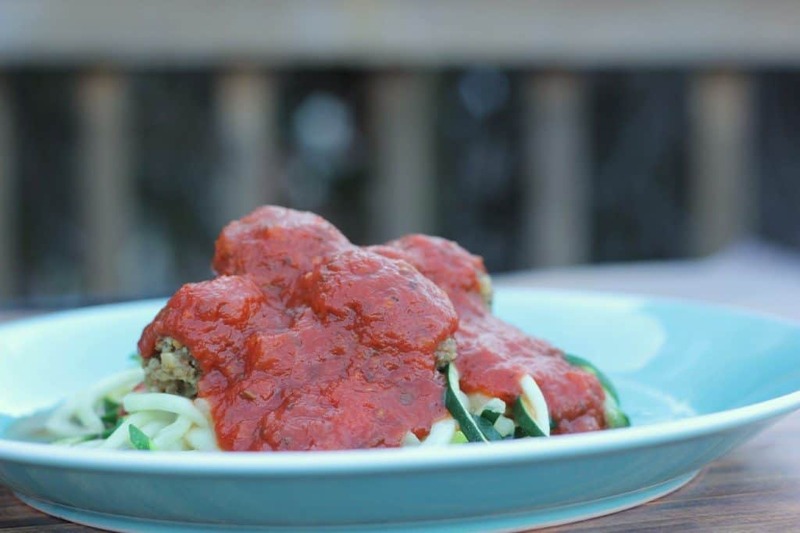 We love our zoodles here, so I will have try these meatballs to go along with them. Great idea! 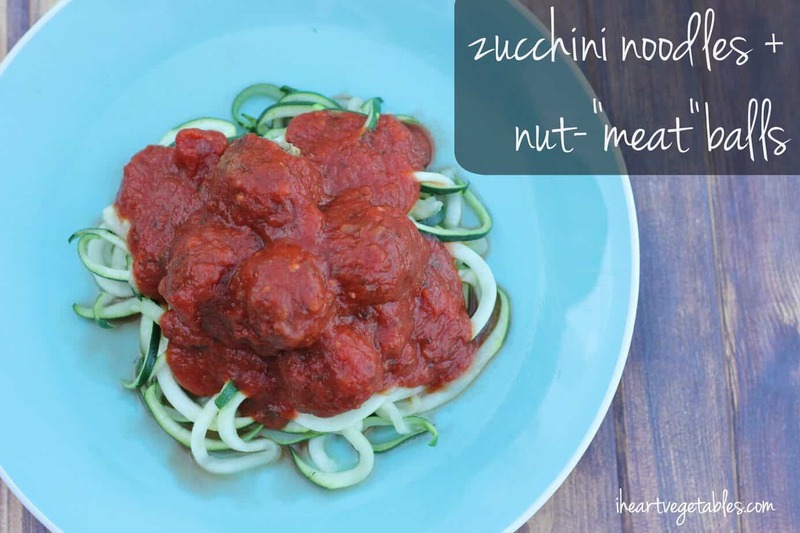 I’ve never tried nut meatballs and love the idea of eating less processed fake meats (my husband really has a thing for them, meh). This looks so tasty! And the cooked rice in the meatballs is such a fascinating ingredient, I never would have thought to use that. 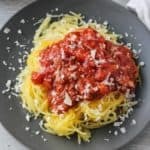 I haven’t had zoodles yet, but I find that I’m always hungry about half an hour after I have spaghetti squash. I usually have to pair it with meatball as well. wow, nut meat. never seen this before. very nice. i’ve made quinoa meatballs in the past, but i love the addition of walnuts. nice. Your sprializer spiralizes so beautifully 🙂 I’ve tried veggie “meat” once – at a T-giving potluck, one of my friends made a loaf that had nuts, rice and veggies. I think she got the recipe from Smitten Kitchen. Anyway, it was delish!! These nut balls look delicious, Liz! 🙂 I haven’t had zucchini noodles in forever but this is making me crave some. Looks so healthy and satisfying! I love this dish! I can’t eat nuts except pinenuts, and they should work great in this recipe. PERFECT for me and my family!!! Thanks! I tried something similar at Whole Foods last week and LOVED it- Need to give this a go!